DtC Shipments of Pinot Noir Increase According to Wines & Vines (January 2015), directto- consumer (DtC) yearly sales reached $1.8 billion for the year (November 2013 - November 2014), which was 16% higher than the year before. Consumers spent the most dollars on wines priced between $30 and $59.99 a bottle, but wines priced even higher were close behind. Within the $30 to $59.99 segment, Pinot Noir had the largest share by value, followed by Cabernet Sauvignon and red blends. Cabernet Sauvignon was the best-selling DtC varietal overall. Chardonnay was still the bestselling varietal in the marketplace with the highest off-premise sales of any varietal, capturing 20% share of the market by value and volume. Oregon Showed Most Growth Outside of California in 2014 According to Wines & Vines (December 2014), Oregon had the most new wineries outside of California in 2014 at 78, mostly in the Northern Willamette Valley. California!s Napa County had 84 new wineries, the most of any wine region in the United States. Napa has 1,042 wineries, the highest total overall, accounting for almost a third of the 3,803 wineries in California. Sonoma County, with 783, has the second highest total. 69 new wineries opened in Sonoma County in 2014. IPNC Celebrates Historic Anniversary in 2015 Fifty years ago, David Lett planted the first Pinot Noir vine in the Willamette Valley. This year!s International Pinot Noir Celebration (IPNC) is toasting 50 years of growing Pinot Noir in Oregon!s Willamette Valley. The event will begin at the Grand Seminar, where you will learn how Pinot Noir is made. Taste a Champagne flight of three single-varietal bottlings crafted from Pinot Noir, Pinot Meunier and Chardonnay. Experience a “dosage trial” and understand how this step transforms texture, balance, and the final expression of the wine. Finally, raise a glass filled with a surprise wine, only to be unveiled at the IPNC. Imbibe plenty of Pinot Noir as winemakers conduct engaging seminars as part of the “University of Pinot,” and frolic at the alfresco tastings and sumptuous meals throughout the weekend. Visit www.ipnc,org to confirm your place at the celebration. New Majority Ownership at Kosta Browne Kosta Browne Winery has new financial partners, J.W. Childs Associates, with the founders remaining co-owners. The Vincraft Group joined Kosta Browne (originally founded in 1997) as investment partners in 2009, followed by the building of a new winery at The Barlow in Sebastopol, and Kosta Browne!s first vineyard acquisition in 2013, with the purchase of 20 acres of Keefer Ranch Vineyard. The new partnership also includes the CIRQ Estate Pinot Noir brand, crafted by winemaker Michael Browne from two hand-picked estates in the Russian River Valley. John Childs of J.W. Childs Associates has been a majority investor in the CIRQ Estate. 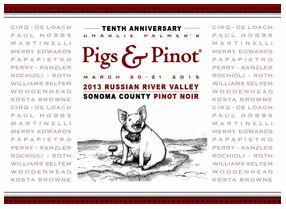 10th Annual Pigs & Pinot Weekend If you are not on the mailing list and did not know that tickets went on sale recently (January 13 for Visa pre-sale and January 14), you missed out on this event held at the Hotel Healdsburg. You may have missed out anyway, because this celebration is so popular that tickets sell out within 15 minutes. You can join a waiting list at www.pigsandpinot.com. A special commemorative Pinot Noir bottling was offered in 1.5L and 3.0L formats. This exclusive wine blends Pinot Noir wine from twelve iconic Sonoma County Pigs & Pinot Gala winemakers including winners of the coveted Pinot Cup that have participated over the last decade. Only one barrel made. As of January 17, the wine was still available on the website. Climate Change Predicts Changes in Wine Production and Taste 2014 was the world!s warmest year on record and was the warmest vintage on record in California and Oregon, beating out 2013, the next warmest. A press release from BigGreen.co.uk, a company that is a leading expert in recycling and waste disposal for businesses, discussed what people have called a “grape-ocalypse.” Some are predicting that many traditional winegrowing areas will be lost in as little as 35 years as the prime winegrowing regions move northward. However, even as global warming leads to larger yields and changes in taste of wines, winegrowers are adapting to insure timely and quality harvests. Alcohol levels are likely to rise, as one Australian writer put it, “Wines are bolder tasting....and pack a boozier wallop.” British Columbia is one northerly region that is being touted as having considerable upside in the future and may prove to be an important source of Pinot Noir, the grape that loves warm sites in cool areas. Kistler Vineyards Finally Opens Arms to Consumers Beginning in the early 1980s, I became a buyer of Kistler Chardonnays primarily because my spouse adored those wines. Despite buying a few cases of the wine a year (it was more affordable back then), there was no opportunity to visit the winery or taste the wines, or even meet the principals. Beginning last summer, Kistler reached out to their consumer base through their Director of Hospitality, Brooke Barnett, and invited them to visit. Early this year, the original barn at Trenton Roadhouse Vineyard will be converted into a small winemaking facility, with additional space among the barrels for wine tasting and limited dining. The goal is to harvest the best sections of the Trenton Roadhouse Vineyard, and to barrel ferment and age the wine in the barn, offering guests the opportunity to see the process firsthand while enjoying a glass of Chardonnay. Kistler offered multiple Chardonnays in the 2012 vintage including a Sonoma Coast blend, a Sonoma Mountains blend, Dutton Vineyard, Kistler Vineyard, Trenton Roadhouse Vineyard (some magnums in 2012), Vine Hill Vineyard, Hyde Vineyard, Hudson Vineyard, Durell Vineyard, Stone Flat Vineyard, and a special Cuvée Cathleen bottling. 2012 Pinot Noirs include a Sonoma Coast blend, Occidental Station Cuvée Catherine, Kistler Vineyard, and Silver Belt Vineyard Cuvée Natalie. Two Pinot Noirs are offered under the Occidental label: Occidental Wines Bodega Highlands Cuvée Elizabeth and Occidental Wines SWK Vineyard. Kistler wines are sold through a mailing list with allocations based on the time on the list and past buying history. Visit www.kistlervineyards.com to join the mailing list or schedule a visit and tasting ($75 for four wines, $150 for seven wines) in Forestville at the Trenton Roadhouse Vineyard barn. 2015 San Francisco Chronicle Wine Competition Award Winners The largest competition of American wines in the world recently announced their award winners. 59 professional judges tasted over 6,417 entries in early January. Many of the award-winning wines will be available for tasting at the Public Tasting, held on February 14, 2015, at Fort Mason Center in San Francisco. The Red Wine Sweepstakes Award was a tie between 2012 Sonoma-Cutrer Founders Reserve Russian River Valley Pinot Noir ($65) and 2012 Pezzi King Estate Row 14 Reserve Dry Creek Zinfandel ($50). Best of Class Pinot Noir Awards: Pinot Noir up to $19.99 - 2013 Cameron Hughes Wine Monterey County Pinot Noir, 2013 Mirassou Sun California Pinot Noir (tie); Pinot Noir $20 to $24.99 - 2012 CRU Santa Lucia Highlands Pinot Noir; Pinot Noir $25 to $29.99 - 2012 Gloria Ferrer Carneros Pinot Noir; Pinot Noir $30 to $34.99 - 2012 CRU Richard's Santa Maria Valley Pinot Noir, 2012 Anaba Sonoma Coast Pinot Noir (tie); Pinot Noir $35 to $39.99 - 2011 Teac Mor Vineyards Russian River Valley Pinot Noir; Pinot Noir $40 to $49.99 - 2013 McIntyre Vineyards McIntyre Estate Santa Lucia Highlands Pinot Noir, 2011 Storrs Winery and Vineyards Christie Vineyard Santa Cruz Mountains Pinot Noir (tie); Pinot Noir $50 and over - 2012 Kenneth Volk Vineyards Steiner Creek Vineyard San Luis Obispo County Pinot Noir. For all medal winners, visit www.winejudging.com. 2015 New Hampshire Wine Week The New Hampshire Liquor Commission is putting on a week long wine event, January 26-February 1, that includes educational seminars, extensive tasting of multiple varietals, gourmet food and more. New to the event this year is a “Mini Pinot Noir Camp” on January 28, featuring some of Oregon!s top winemakers. Four Oregon Pinot Noir focused wineries will gather for an exclusive seminar and special dinner including Lange Estate Winery and Vineyards, Adelsheim Vineyard, Firesteed Cellars, and Erath Winery. The week-long event will include the 12th Annual Easter Seals Winter Wine Spectacular featuring over 1,300 wines with winemakers from all over the world, including noted Pinot Noir specialists J Vineyard, Steele Wines, Rodney Strong Vineyards and Davis Bynum Wineries, Sonoma-Cutrer Vineyards, Peter Paul Wines, R. Stuart & Co. Winery, and Robert Sinskey Vineyards. Winemaker Bob Cabral Joins Three Sticks Wines in Sonoma Bill Price, owner of Price Family Vineyards, Classic Wines, LLC, and Three Sticks Wines, announced that Bob Cabral, formerly the winemaker at Williams Selyem, will be partnering with his team at Three Sticks Wines as Director of Winemaking. Ryan Prichard, one-time harvest intern for Cabral and former assistant winemaker for Medlock Ames, will join the team as associate winemaker. The new team will work alongside winemaker Don Van Staaveren as he moves to the title of Winemaker Emeritus and continues to craft the Three Sticks Cabernet Sauvignon, Pinot Blanc and Castenada Wines. Cabral said he has longed to work with grapes from Durell and Gap!s Crown vineyards. The new winemakers will blend and bottle the 2013 vintage in the coming weeks. Visit the Three Sticks website to find out more about Cabral, and join the mailing list at www.threestickswines.com. Winter Wine Escapes Winter is a surprisingly good time to visit California wine country. Hotel rates are lower, winemakers are more available, roads and wineries are less crowded, and there are many notable events. Examples include: Lodi Wine and Chocolate Weekend (February 7-8), 37th Annual Barrel Tasting Weekend, Northern Sonoma County (March 6-8 and March 13-15), Livermore Valley!s 7th Annual Barrel Tasting Weekend (March 21-22), 4th Annual Winter Wine Classic, Santa Barbara County (January 24), 10th Annual Wine Fantasy, Santa Barbara County (February 13-16), World of Pinot Noir (March 6-7). For more information, visit www.discovercaliforniawines.com. 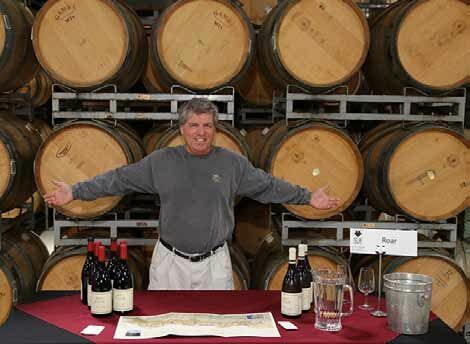 A number of events are held in the Willamette Valley of Oregon as well: Heart of Willamette!s 5th Annual Barrel Tour (February 7), Sip McMinnville Wine & Food Classic (March 13-15), Oregon Chardonnay Symposium (March 14). For a full listing, visit www.willamettewines.com/events/. 50 Years - Pressing On Willamette Valley Wineries Association is celebrating the 50th Anniversary of Winegrowing in the Willamette Valley on Febraury 21, 2015. The wine tasting will be held at Pure Space, an urban venue in the Pearl in Portland. The event will feature an unparalleled tasting of library wines, food by Art of Catering, live music, historic photo displays, and an enormous family portrait. Tickets are $150 per person until February 10, 2015, at Eventbrite. 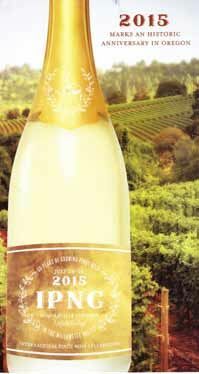 Santa Lucia Highlands Artisans Annual Gala SLH Gala IX on May 16 will feature more than thirty Santa Lucia Highlands labels pouring their wines. Tickets go on sale in early February and sell out quickly. Visit the Santa Lucia Highlands Artisans website at www.santaluciahighlands.com. Report on Williams Selyem Charity Auction Dinner Blake Brown sent me a report on a charity auction item from this year’s Central Coast Wine Classic. The lot, which included many of Burt Williams’ Williams Selyem wines from 1984 to 1997, and a dinner for 10 at the San Ysidro Ranch, raised $16,000. The event took place on December 3, 2014. Some of the top wines of the night included a 1995 Williams Selyem Allen Vineyard Russian River Valley Chardonnay in magnum, a 1985 and 1991 Williams Selyem Rochioli Vineyard Russian River Valley Pinot Noir, and a 1996 Williams Selyem Precious Mountain Vineyard Sonoma Coast Pinot Noir. Blake said, “This was one of the finest wine experiences I have ever had. The combination of the friends who attended, the ambiance, food, service and especially the wines were as good as it gets and to know charities benefited from the pleasures we all shared made it even more special. 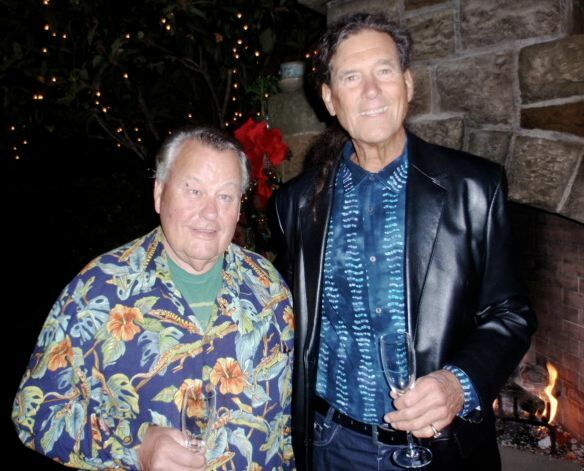 Photo below shows Burt in his signature Hawaiian shirt and Blake at the event. Petaluma Gap Proposed AVA Presentation and Tasting An evening of information on the Petaluma Gap wine region and its proposed AVA, and a tasting of Petaluma Gap wines will be offered at the Healdsburg Public Library on Friday, January 30 from 7:00 PM, to 9:00 PM. Tickets may be purchased online at Eventbrite: www.eventbrite.com/e/petaluma-gap-birth-of-an-avatickets- 14883116803?aff=es2&rank=6. New Look for the PinotFile After 12 years, and close to 350 issues, I felt it was long overdue to refresh the Prince of Pinot/PinotFile Home Page and make a few other changes on the website. Same content, better organization. With the assistance of Wendy Coy (Coy Design in Sebastopol), Peter Rowell (my long time website techie who retired last year), and Michael McDonald (my new website techie), we have transformed and modernized the Home Page. Look for the changes soon. For the half million visitors to the website over the past year, I say thanks for your interest. I especially want to thank those who sent me thank-you’s, compliments and suggestions. Feed back is very important to me. W.S. Merwin wrote in Opening the Hand, “I asked how can you ever be sure that what you write is really any good at all and he said you can’t, you can never be sure.” Feed back motivates me to try harder to enhance your Pinot Noir drinking experience.